Attack 1: [D] Feint Attack - Chose 1 of your opponent's Pokemon. This attack does 20 damage to that Pokemon. This attack's damage isn't affected by Weakness, Resistance, Poke-Powers, Poke-Bodies, or any other effects on that Pokemon. 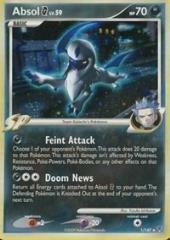 Attack 2: [2D] Doom News - Return all Energy Cards attached to Absol G to your hand. The Defending Pokemon is Knocked Out at the end of your opponent's next turn.